How To Study The Bible For Yourself looks at the processes behind personal Bible study so that you can study the Bible more effectively. These days personal Bible study is an essential part of the Chrisitan Church. More and more people are studying the Bible for themselves. Putting all things aside, personal Bible study really comes down to four processes. Four processes that will help you to be consistent in your interpretation and application of the Scriptures. 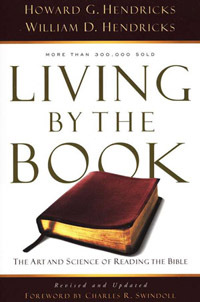 The aim of this webpage is to introduce you to these four processes in a brief and succinct way and to draw your attention to a book that will give you more information: Living By The Book by Howard Hendricks and William Hendricks. When it comes to personal Bible study, we seldom explore the process of preparation. And yet, the Bible is very clear about the preparation of the heart for receiving biblical truth. "Get rid of all moral filth and the evil that is so prevalent and humbly accept the word planted in you, which can save you." (James 1:21). "Rid yourselves of all malice and all deceit, hypocrisy, envy, and slander of every kind. Like newborn babies, crave pure spiritual milk, so that by it you may grow up in your salvation, now that you have tasted that the Lord is good." (1 Peter 2:1). Preparation prepares the heart to say to God. "Open my eyes that I may see wondrous things from Your Word" (Psalm 119:18). The preparation process involves prayer - prayer cleansing and humility so that you can recieve wisdom and knowledge from God. "We have not stopped praying for you. We continually ask God to fill you with the knowledge of his will through all the wisdom and understanding that the Spirit gives, so that you may live a life worthy of the Lord and please him in every way: bearing fruit in every good work, growing in the knowledge of God" (Colossians 1:9-10). The preparation process gives you the greatest potential to recieve with humility God's life-changing Word. The next process is observation. Observation is asking and answering the question: "What Do I See?" In many ways, you become a biblical detective by looking for clues so that you can understand what is going on in the text. Observation involves crucial terms, grammar, literary structures and forms and setting and feelings within the text. The goal of observation is to collect all the clues so that you can determine the meaning of the text of Scripture that you are studying. Now that you have all the clues you can determine the meaning of the text. This process is called interpretation. Interpretation asks and answers, "What Does It Mean?" In many ways, observation and interpretation go hand in hand. As you gather information (observation), you begin to put it all together (interpretation). Howard and William Hendricks have produced a little book that simplify these processes so that everyone can enjoy the benefits of personal Bible study. Living By The Book is definitely worth your consideration. Application is putting it all together. Once you discover the meaning of the text, you need to ask yourself, how did this text of Scripture apply to the original hearers and does it still apply to hearers today? Observation and interpretation should always lead to application. As King David prayed, "Give me understanding, and I will keep your law and obey it with all of my heart" (Pslam 119:34). Personal Bible study is about understanding Scripture so that God can change our lives.